The BCNR operates several Subdivisions in north-western British Columbia. The Stewart Sub which provides the BCN with an interchange with the Alaska Railroad (ARR) trough railway owned ferry and barge service. The Port Adams Subdivision provides access to loads from the Silver, Zinc and Lead mines in the area, as well as the railway owned machine shops. The Northern Subdivision connects the BCN with the formerly abandonned – or initially never completed – Dease Lake extension of the Takla Subdivision the CN inherited as part of the BC Rail acquisition in 2000. The BC Northern leased the trackage and roadbed for completion and operation from Chipmunk (the physical end of the line) to Dease Lake. This remote route provides access to many of the recent mineral extraction sites south of the Yukon Territory. The Terrace Subdivision or Southern Subdivision connects the BC Northern Railway with the Pinewood (fictional name) and Thunder Ridge (fictional name) Branch lines. The trackage south of Rosewood is incomplete (unusable sidings), old (not up to current standards with wooden, partially rotten ties and therefore abandoned, as there is a much easier route available over the Hazelton Subdivision. The Hazelton Subdivision connects the BCN with the CN Interchange at Hazelton. Photos and great Travel Notes of the Stewart Cassiar Hwy. and the Glacier Hwy. 37A can be found at the ExploreNorth Blog by Murray Lundberg from Whiethorse (Yukon Territory). This Blog ist such a great source of local information, that I will draw a lot of inspiration for my Model Building from the site. Also the RailsNorth website provides loads of Information. Dease Lake – Chipmunk BC – Telegraph Creek – Meziadin Lake. Again the ExploreNorth Blog will be a valuable source of information. The Portland Canal Short Line Railway (PCSLR) began construction in June 1910. The operating right granted the railway to build a line from Stewart/Hyder inward across Bear Creek Pass. It served various mines along its later up to 21km right of way. The roster consisted of two identical Pittsburgh Works 2-6-0 steam locomotives built in 1891. Cars were predominantly wooden box and flat cars. A single combine provided for passenger transport. There was no turntable or wye. Both locomotives operated with the front pointing away from the coast. At Steward an immense wharf had to be build to get the railcars across the tidal flats of Stewart Bay to the deep water area of the Portland Canal, where the steamers of both the Pacific Steamship Company and the Union Steamship Company usually moored. Several plans were made, to make Stewart the western terminus of a potential fourth transcontinental railway in Canada. And survey of the right of way was completed up the Bear River Pass to Meziadin Lake though the trackwork didn’t extend beyond Red Cliff in October 1911. The projected route included a more than 650m long tunnel under the pass and skirted the lake around its northeastern shore. From there plans were drawn to swing south towards Hazelton, where the Grand Trunk Pacific line was located. The railway however – by then – sported a new name, the Canadian Northeastern Railway (CNER). It operated until 1915. By the. In reality the railroad discontinued any plans to expand their network furthet east. In the alternate History of my BC Northern Railway, this marked the turning point. Contrary to the survey information that the Groundhog Mountains coal deposits were said to be warped and inaccessible from an economical point of view, this coal field proved to be nearly as rich as Mann, the Railway Chief Executive Officer, had envisioned. 1910 – First standard gauge Railroad Tracks laid in Stewart, BC, Canada. 1912 – Nass River Lumber Co. opened a 3ft narrow gauge line between Meziadin Lake, BC and several logging camps in the area, it bore no official name and was known as the Nass River Logging Railway among workers of the camps. It was projected to interchange with the PCSLR/CNER. When the motherlode of the Red Cliff mine was finally found in October 1924, traffic increased dramatically. 1917 – Two Copper ore mines opened, existing 3ft mainline upgraded to standard gauge. Logging branches still used 3ft gauge. Trains were transloaded at various sidings of the mainline. 1919 – Canadian National Railway formed by conglomeration of several financially troubled railways: The Grand Trunk Rwy (1923), the Grand Trunk Pacific Rwy., the Canadian Northern Rwy., the Intercolonial Rwy and the National Transcontinental Rwy. 1920 – Dunwell Mine located at Bitter Creek opens, a spur connects the mine with the CNER. 1920 – Coal mine opens near Meziadin Junction. Workforce requirements and increasing freight volumes boost population in the area. 1923 – Blue Hills Coal Mine opened near Alice Arm. Mainline extended south to haul coal frome this mine to the port of Steward. The old tracks to Meziadin Jct. were now officially called Northern Division, while the line south was then known as the Stewart Division. 1929 – Consolidated Mining and Smelter acquired the charter and did some work on the line, the world depression cancelled their plans. 1930 – British Columbia Northern Transportation and Mining Co. (BNTM) incorporated. The holding company aquired several short lines to form the initial British Columbia Northern Railway Company. 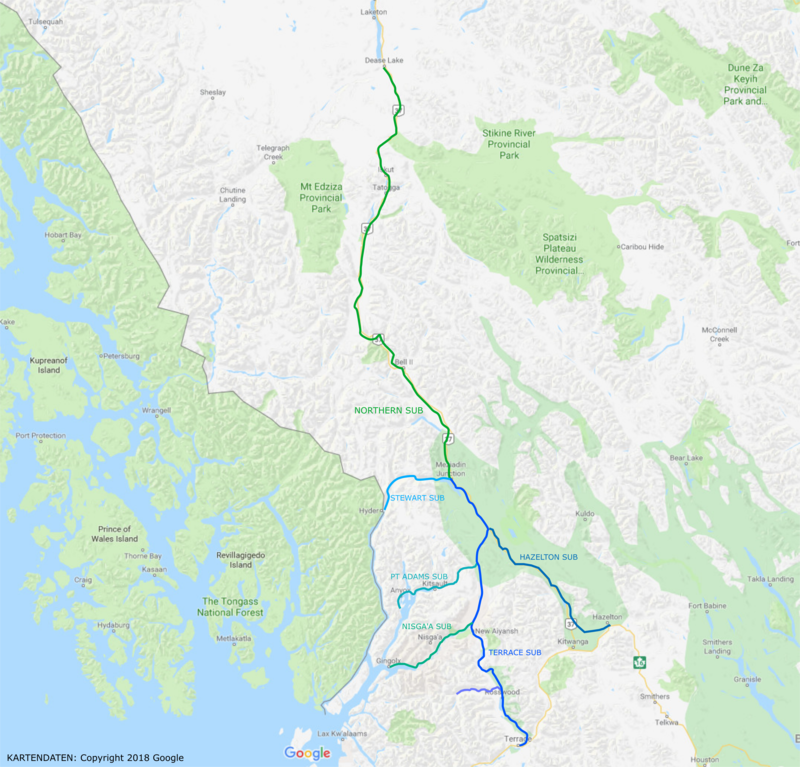 Early this year BNTM took control over the Nass River Lumber Co. (NRLC) and in June 1930, the BC Northern aquired the CNER to merge the two railways. Standard gauge track was laid up to Meziadin Lake where there was a dual gauge interchage yard with the BCNR in 1931. This became Meziadin Junction and also the first HQ of the BCNR. 1930 – Logging Camps, a Paper Mill and a Coal mine open near Mill Bay. BCN mainline further extended south to get the comodities to the sea. The two legs of the Steward Division were named Portland Subdivision (from Stewart South to Alice Arm) and the Alice Arm Subdivision (from it’s namesake town to Mill Bay). 1934 – Board of directors discuss a connection to Prince Rupert via Port Simpson. The plan is rejected due to the financial strain. THis year also marked the commercially least prospective era of the railway. It fell into financial decline several times and only barely excaped bankrupcy as many times. 1940 – Northern Division extended via Meziadin Jct. to Thunder Ridge (a freelanced location name), where a big ore mine has opened (this extension was known as the Thunder Ridge Subdivision). 1952 – Port Adams, a barge slip and ferry pier outside Mill Bay inaugurates Barge Service to Prince Rupert (to interchange railcars with CNR). Company housing is provided at the site. 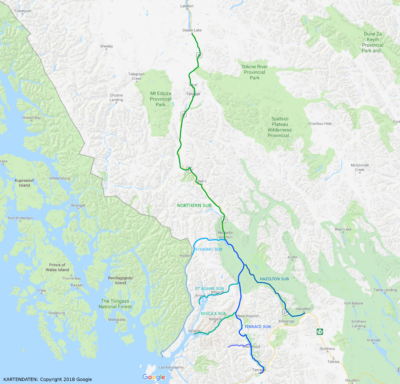 1967 – BC Northern finally connects its mainline to Port Simpson and Prince Rupert to interchange with the Grand Trunk Pacific Railway (GTP), which is now the Canadian National Railway (CN). 1970 – Port Adams now operates Barges to Alaska. The village of Mill Bay is now part of the town of Port Adams. 1978 – The year after BC Rail stopped contruction of the line to Dease Lake somewhere near Jackson, BCN finally finished construction of the last leg of it’s Northern Division to Chipmunk, BC, where a small interchange yard (at the BC Rail site) is located. 1990 – After finanvial crisis competitor CN aquired about half of the stocks dealed at canadian stock exchange markets and was technically in control of the railroad since then. The operation continued as a joint venture between BCNorthern Holding and CN, leading to a variety of rolling stock. locomotives sporting CN paint schemes with BCN sublettering joined BCNs fleet of locomotives in an Ontario Northland similar paint scheme.